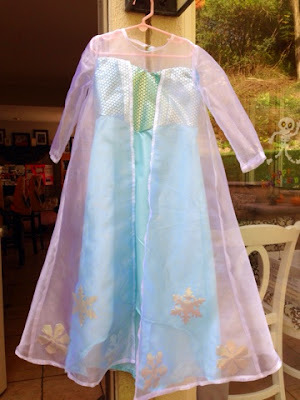 Frozen costume add-ons: Halloween post! 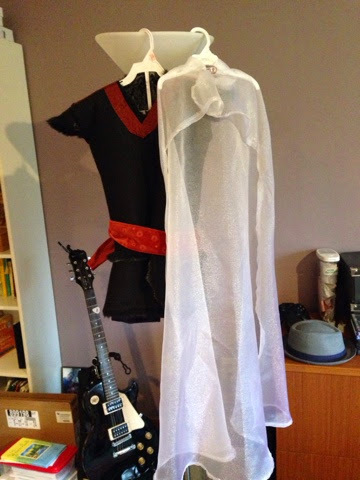 So every Halloween I post about the twyns' various outfits and adventures, and for this year, we have a cliffhanger! 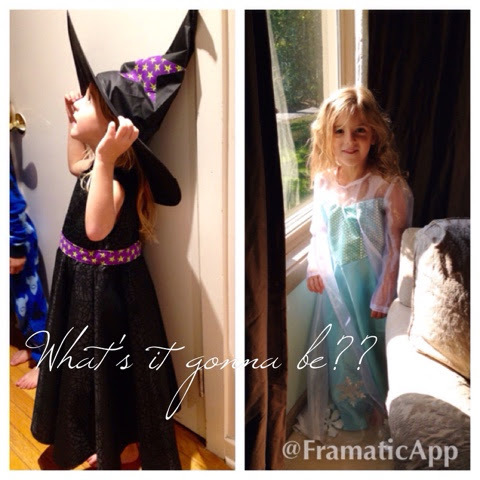 Let's watch and see which she picks for trick-or-treating. 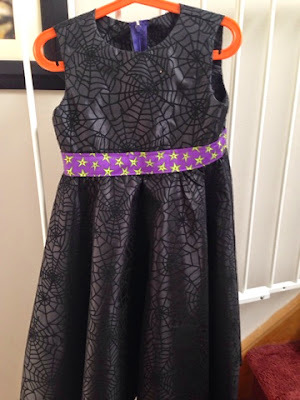 We also have the Halloween parade at school, which is why I indulged her Witch wish, because I think it will be much easier to play all day in. I also spent some time making some Frozen-themed extras for a twin mommy friend of mine's children. 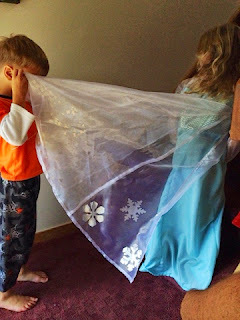 She has three, so they will be Elsa (older daughter), Anna & Kristoff (younger boy/girl twins.) ISN'T THAT JUST AN ADORBS IDEA!?! TOO CUTE! Anyways she asked for a 'longer train' for her store-bought Elsa costume. 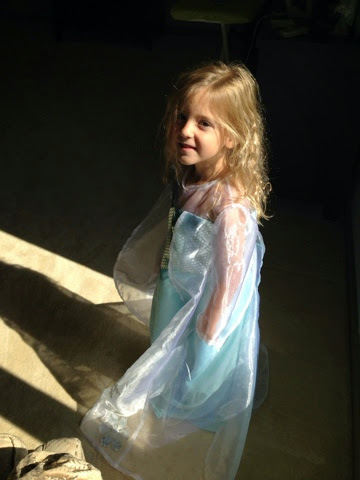 So I used the cape part of the pattern from my daughter's Anna/Elsa package. 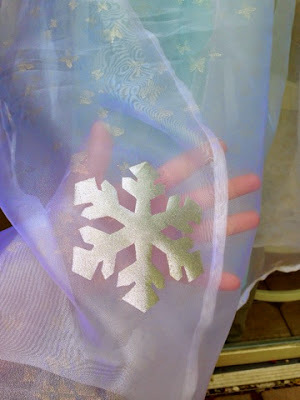 I got a sheer fabric, did not line it (saved time & money!) and added a jeweled button. You could cut this in an hour and, if you are making this last minute, don't even hem it! It took about a yard and a half, depending on height. 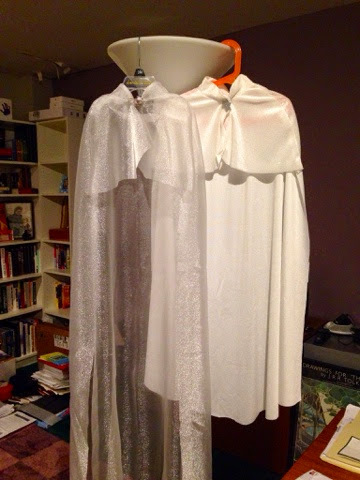 I actually gave her a choice of two - a glittery white fabric that also didn't need to be lined, and the sheer. She chose the sheer. She also asked me for some kind of 'vest' for Kristoff. I thought this sounded like a perfect idea - who needs an entire costume when you can just pull over some kind of animal-skin looking fabric and attach a reddish/orange-ish belt? 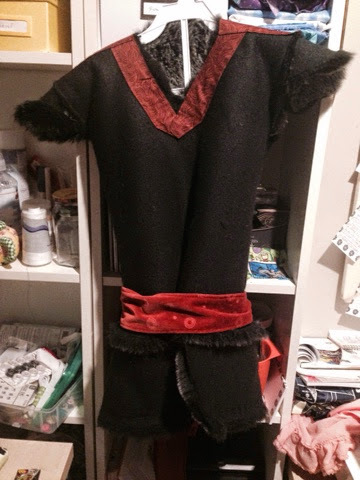 I took a 3T sweater vest of my son's and used the pattern to cut the bodice of this vest. 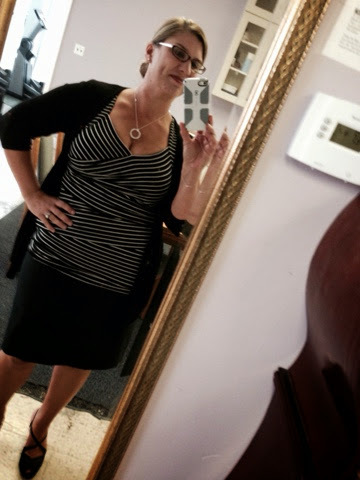 Then, I took it one step further by attaching the half-circle hip sections and cap sleeves at the shoulder (got that idea from this blogger.) 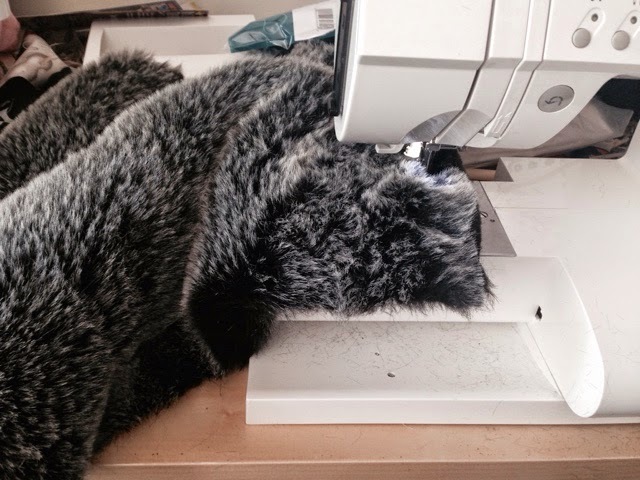 To make it really authentic, I attached the seams facing out , so that you would see the fur underneath. This is actually a super easy sewing technique that made it look even furrier and more authentic. 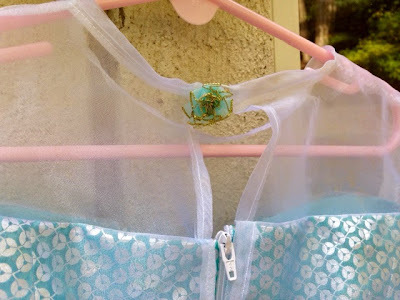 I hand-sewed the trim around the neck, but you could also just leave it off or attach it with fusible for the night if you are stuck for time! 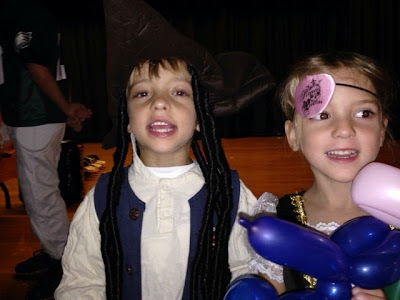 We have actually already had a lot of Halloween fun around here, including a party at school, in which the twyns won "Cutest Costume" for being the "Pirate twins." 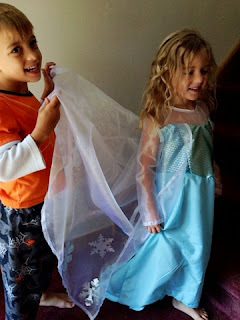 They wore their Disney Cruise costumes and, I must say, did look pretty put-together. After my daughter complained about the shoulder seam itching her, I finally took my bestie's advice and had my daughter wear a long-sleeved leotard underneath. Lord knows we don't need it for ballet class anymore...sniff...anyways, this brought about a much more happy side of Elsa. There you have it! 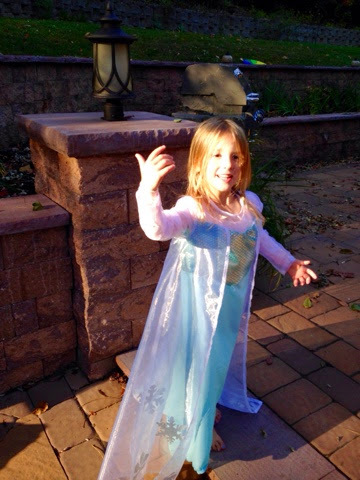 Hope it helps you get your Frozen on this Halloween! Whew! It's been a while since my last audition report, hasn't it? It's been hard for me to find that perfect balance of a production that's not too far from home, has a role for me, and isn't smack dab in the middle of a quarter end. Yes, I think we live our lives quarter end to quarter end. Hubby informs me that not only are we celebrating our tenth year of marriage, but this is also our twenty-fifth quarter end. Woop. So I digress. This show hit the mark, and I hadn't introduced myself to this theatre yet. So it was time for them to hear the vocal stylings of the one, the only, TwynMawrMom. So, somewhere in my closet, out came THIS. My lucky shoes, no doubt, but also some kind of 50's getup. And the mom cardigan, cuz, you know, it hides my arm flab. The show was Always...Patsy Cline...and I emailed them I would be auditioning for the role of the best friend because, I figured, there are probably a lot of Patsy Cline-wannabe's out there who have actually studied her voice, music, look, and...I'm: not one of them. So they emailed me three sides and three songs from which to choose one of each. I chose the sequence/side that led into the song "I Fall to Pieces" because it had that nice low note in it, which shows a nice side to my voice. Not that I don't have many awesome sides to my voice, wink wink, toot toot, but you know, mama's always got the low notes, even though the High C and I broke up, like, 13 years ago. I drove to Bristol, PA, which is a super cute town. It has a river crossing that looks restored from the 1600's and it's just adorable. The theater rehearsal space, however, was a super modern warehouse-looking thing in the middle of some historic houses, so I missed it on my first pass. When I got inside there were two girls there who both sang Patsy songs and nothing more. So clearly they were just going for the Patsy role, not the best friend. I think in the play, the character of Patsy does most of the singing and the best friend, Louise, does most of the talking. Note to young auditionees: go ahead and audition for the part with the meatiest audition material. You could have done a monologue on top of your song, and showed more of your talent to this theater/producer/casting agent in the process. Do a little research! You have YouTube, you have: no excuse. Yes, you might not be old enough for the best friend, but do you really look like Patsy Cline? So, there ya go. I heard them both sing and they both sounded very lovely. The pianist corrected each of them on a phrasing and had them each re-sing a part. These were two separate auditions, so I was starting to see if this was a pattern that I might need to prepare for. But when I went in, I told them I chose the selection and song sequence together and they (the casting director and pianist/music director) acknowledged that was a good plan. I started the monologue and she asked me to stop and start again further back from her. She said I was 'too on top of her and she couldn't assess my talent at all.' So I tried not to let it affect my focus and got to the back of the room to start again. I do have a loud voice, and the sound was bouncing off the walls quite a bit so it made sense to pull back. Then I started directly into the song with a side nod to the pianist. I thought it sounded great. He said it sounded great, and did not correct me. So I don't know what that means - was my singing really that spot on the money, or did they just need to make sure I could hold a note since the part would only require minimal singing anyway? Who can tell. But it always surprises me when people say, "So when will you hear?" and I have to inform them, "Most of the time, NEVER!" And you know, even if I could just get a little call saying, "We liked you but not for this role" or "You look too damn young for your voice/maturity level"...I would just go ahead and call Sally Field and ask her WTF. Ok I had many grand ideas in mind when creating this post, but I'll just let the photos do most of the talking. 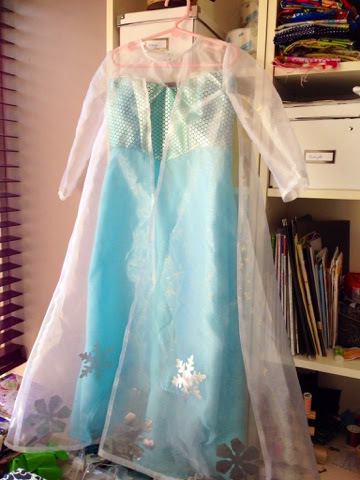 I've been working on Elsa for a few weeks now (about 3 full days time, I would say.) I was using this pattern (McCall's Costumes MP381) as an exercise in my patience and truly following a pattern from beginning to end. There are soooo many times I wanted to do things "my way", but, I have to say, it was worth going through all the standard motions. Found this cute button in my stash, thought it fit well. Zipper's a little wonky, ergh. 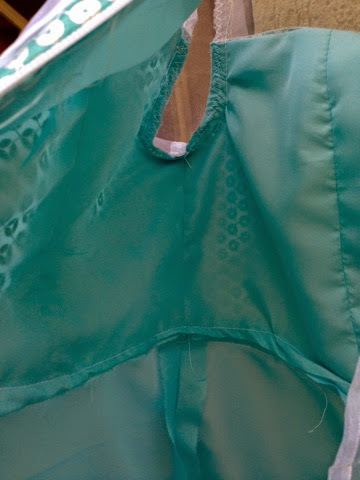 The lining was my first in this fabric; a little wonky on the bottom but straight and taut! Cutting out the snowflakes was a pain but I'm an applique master at this point so I had to put on a few extra. The sheer fabric had a golden butterfly shimmer to it so the whole cape just pops! Feel like I slaughtered a bear with this one. And the shedding!!! Thanks for reading / listening!